Looks can be misleading - prices, too! Thule Audio is a Danish company, specializing in audio equipment, ranging from basic entry level models, to models which are High End stuff. The product line is well thought out, and as we shall see, very rationally conceived and executed. For other reviews of Thule Audio products, look over the site. Both cases are virtually identical, and share the overall look of the entire Thule Spirit range. They are made of uncommonly thick, heavy and well finished cases, while front panels are made from 8mm thick aluminium, machined so that they have a gentle slope. 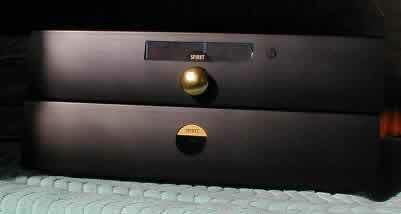 In the center, one will find a "gold" knob in case of the preamp, and a decoration in case of the amp. The preamp has an alphanumeric display above the knob, which provides the user with all relevant information on power on, volume and input status in red LEDs. All this is fully remote controllable, and a remote control unit is supplied. 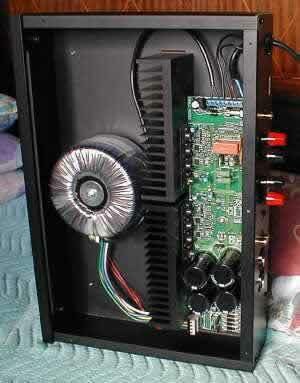 The power amp is a very simple affair, with only a red LED power on indicator on its front side. Both units have rocker power on/off switches at the back, as they're intended to be left in standby mode all the time. Both units share much more common componentry that I would have imagined. Both use toroidal power supplies, where the amp's toroid is rated at 500VA, while the preamp's toroid is rated at 300VA. No, you're not seeing things, it's not a typo error, I did say 300VA. That's enough for a 2x75W/8 Ohm power amplifier, let alone a simple preamp. 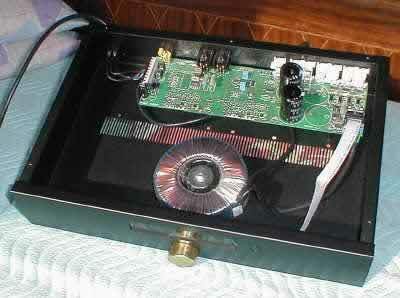 In fact, the preamp is EXACTLY the same as the IA60 integrated amplifier, minus the power amp circuitry and heat sinks. Put another way, the preamp consists of the preamp section of the IA60 integrated. Hence the 300VA toroidal transformer - that's what they use in IA60 (see review on this site). The power amp, on the other hand, is once more the same board, but minus the preamp circuitry and with heftier power supplies - bigger transformer, and 4x10.000uF capacitors, instead of just 2x10.000uF. This is no accident, this is rational thinking. Use the same board, use the same case, use the same power supplies and you increase the numbers of your serial production, thus pushing the cost per unit down. The only thing that spoils the show is the preamp's price - it's simpler than the integrated model, but it's not only not cheaper, it's actually somewhat more expensive. That is most odd, I must say - probably for "complex marketing reasons" (a phrase I first heard in the early seventies, and it's gotten worse since then). You still have 5 line level inputs, with no option for a phono RIAA board of any kind. You still don't have a headphone output - somebody should inform the Scandinavian audio industry that headphones have been invented some decades ago, they seem to have collectively overslept that event. As usual, all input and output sockets are gold plated. Like elsewhere in Thule's product portfolio, volume and balance are controlled by a ladder of laser trimmed resistors, contained within an LM1792 digital volume control, a good point - no mechanics, no wear and tear, no aging, unparalleled precision. The amp is rated at 2x100W/8 ohms and 170W/4 Ohms - that should be enough for most of us. It has an RCA Cinch and a balanced XLR input, just as the preamp has the same outputs. Acting on logic and Thule's recommendation, I used balanced lines to link the two, except when using other units. I hooked everything up to the small system - JBL CM62 speakers. The sound was Thule's usual relaxed, unforced sound, but something was not quite right at just above whisper levels. The music was there, but it sounded a little distant and slightly shut in. Not compression in crude form, but not free and flowing either. Odd, I thought, given that JBL CM62s are speakers on the bright side. Anyway, I changed over to floorstanding JBL Ti600 speakers. The effect was not only reduced, but in fact made a little more obvious, since these are much more revealing speakers. Finally, the AR94s came in. Now, one could hear plainly that the sound was indeed somewhat distant, a little veiled. For example, Vivaldi's "Four Seasons" seemed like it was being played two or three rooms away, and heard through a common corridor. Led Zeppelin's "BBC Sessions" (courtesy of Geoff Husband - much appreciated, Geoff!) sounded much more like Zep was playing in my small room rather than in appropriate surroundings, and that is one very vibrant, dynamic recording. Hevia lost some of his Scottish vigor and energy, and the bagpipes sounded muted. Vanglis sounded processed. Peter, Paul and Mary's Mary sounded like she had a slight cold. The details are there, or most of them are, though this combo does not shine on that point, there was no tonal imbalance I could complain about, but it all sounded vague and distant. Much energy and presence of some recordings was simply lost. Oh, well, let's turn it up and see what happens. So I turned it up on the JBL Ti600, bypassing the small CM62s. Well, the music got louder, but it didn't get any better. Subjectively, it got worse, simply because subjectively, all faults tend to be amplified, and sometimes multiplied by turning the volume up, if there's a basic underlying design fault. In this, it didn't get worse, it just became more readily apparent. There was a sound with a slight muting effect, as if someone had turned on a compression filter with a gentle range. I still had the feeling of the music being distant, even if it was mostly there, and I say it again, the JBL Ti600 are somewhat up-front, bright sounding speakers. Changing to AR94, which are very neutral but extremely dynamic speakers, the Thule combo ran into real trouble. The veiled sound was shown in full and nothing could cover it once rendered neutrally. It wasn't offending or anything nasty like that, but it was obviously not what it should have been, or is on some competing units. Furthermore, I got the feeling that the amp was struggling driving the ARs on some admittedly very powerful transients. I may well be out of line here, but there's nothing like DVD sound effects to test transients, and I regularly use three DVD titles to check up on this ("Shakespeare In Love", "Terminator II" and "Matrix"). There are some very fast and very powerful transients in "Matrix", which did, I remind you, win a most deserved Oscar for sound effects. Anyway, some of those transients were not liked much by this combo, so I decided to investigate further. I dumped the PR100 and hooked up my H/K HK 680, turned into a preamp by breaking the pre-main connection. The music now sounded much better, more open and immediate, and most (but not all) energy and immediacy was restored. Then I reversed the trick, using PR100 to drive HK 680 as a power amp. Two things happened. The first was that the problem with transients was gone, just like that, nothing. The second was that the HK 680 became more vague and veiled than it usually is, testimony that it was the preamp which was messing things up. Not trusting myself, I repeated the whole thing once more with my economy class reference Yamaha AX592 integrated amp, using it as a power amp and as a preamp. With the expected and known differences, the effect was pretty much the same as with the HK 680. This may come as a surprise, and it certainly surprised me, but the weak link here is the preamp, PR100. It has no obvious or nasty faults, but it has a somewhat veiled and blurry sound, a little too distant for even the British to call it "analytical and detailed, while restrained". Without life and emotion, music is a poor mimicry of itself, and that's definitely not what good audio is about. Unfortunately, that's exactly what the preamp does, it makes music distant, veiled and mostly unexciting. The power amp does better when driven from a different and better source. It is a zero overall feedback design, like all Thule's (and apparently other Scandinavian) equipment, it is reasonably proportioned and very well made. I would have been happier with a bigger power transformer, say 700-800 VA, as it is my feeling that would improve its performance with fast and large transients when driving less than well behaved loads. I can't honestly say I felt the amp was current starved, but it lacked the full freedom from compression I have with my HK 680, for example. Or it could be that its zero overall feedback circuit doesn't take kindly to difficult loads, a known problem with such circuits. Whatever, the PA100 is the better of the two. Compared with the much, much cheaper Yamaha AX592, with exactly the same power rating into 8 Ohms, the sound balance was divided. No doubt the Thule pair had better performance on both extremes, but Yamaha provided a more open and immediate sound, at least in the midrange, with its known performance falloffs on both extremes. However, compared with Harman/Kardon's HK 680, which is nominally less powerful (2x85/130W into 8/4 Ohms), the Thule pair just didn't have a chance. The HK 680 was more open, more dynamic, with no problems with transients and sounded considerably more true to life. So, what's to say? As a pair, these Thule components failed to live up to their expectations and certainly their price class, as they were outclassed on all fronts by an integrated which is somewhat less powerful (about -0.7 dB, no chance in Heaven or Hell you'll ever hear that difference) and somewhat less expensive. Of the pair, I'd say the power amp is the better of the two, with the preamp slowing it down in general. I've never seen a preamp in my life with such a power transformer - nice, but a smaller unit would have kept the price down. While Thule demonstrates extreme rationality in its production, by using the same board over and over again, I would expect something better at this price point. Ultimately, Thule defeats itself, as its integrated amp IA60 sounds better than this pair, even if less powerful. Since it also costs LESS (!?!) than the preamp it contains, I would suggest that prospective buyers buy one IA60 integrated and use its additional preamp outputs to drive an additional PA100, thus enabling biamping, with 2x100W for bass and 2x60W for the rest. That's what I'd do - if I was willing to bet on a blind bet, but since I have my trusty HK 680, I really don't need to go through that. I think you'll do better elsewhere for the money. I have gone on record as saying that in my experience, zero overall feedback circuits are very difficult to design properly and tend to give a somewhat unbalanced tonal picture (or so I think). While their midrange and treble are generally very likable, their bass generally tends to lack control. Also, by and large, zero overall fedback designs tend to have a sweet, but often insufficiently dynamic sound, which lacks incision when required. On the other side of the scales, we have commercial units which use plenty of feedback, and generously provide what is known as "transistor sound", harsh, uncouth sound liked only by those who never heard better. Zero overall feedback designs tend, in my experience, to produce a subjectively debalanced sound, which either has boomy bass or lacks bass. However, that said, I must add that this is not necessarily so - for example, Electrocompaniet's ECI-1, their 2x100W/8 Ohms integrated (just discontinued), is such a refined product that I really cannot fault it anywhere in acoustic terms. So, while it is possible to pull off the trick with zero overall feedback, it's far from easy and is never cheap. I firmly believe that SOME feedback is not just good, it's absolutely necessarry if the amp is to reliably control those bass driver cones. It would be hard to say what is just right, but off hand, I'd say 10-14 dB (3...5:1) would be about ideal. I firmly believe that my HK 680 sounds at least in part so damn good because it uses just 10 dB (3:1) of overall feedback - but I could be wrong. What I know I am not wrong about is that feedback very definitely improves stability and improves the amp's damping factor; as usual, it does not guarantee good sound, and it is far from being the only design consideration. It's not the feedback in itself which causes bad sound in transistor amps, it's the misuse of feedback that's wrong. Use it to polish an already good circuit and you'll have it made.